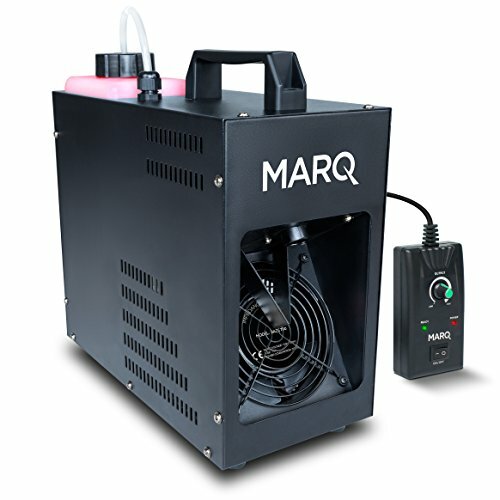 Create dramatic haze effects with the compact, easy-to-use MARQ Haze 700. A variable output control makes it simple to achieve the exact feel you're looking for and the included wired remote ensures simple operation. Note: MARQ’s Haze Fluid Gallon and Haze Fluid Quart sold separately. How do you set it up and know when it is ready for use? First, fill the Haze 700 to its required amount of fluid. Next, on the remote control, set the Power Switch to the On position. The Power light will illuminate, and Haze 700 will begin warming up. Wait for 2–3 minutes for Haze 700 to warm up. During this time, do not press any buttons on the remote control. The Ready light on the remote control will illuminate when it is ready to use. When the Ready light on the remote control is on, turn the Output Volume knob to control the amount of haze. Why is there no haze coming out? This unit will pump out the haze only when the unit is heated up, and the light on the wired remote is illuminated. If it has not had time to heat up then it will not pump out fog. When you plug in the Haze 700 at any time, it needs a few minutes to heat up to work. Also, it is important to check the gauge on the back to make sure there is adequate amount of fluid. Never run this unit dry! What type of haze fluid should I use? We recommend using a high-quality, water-based haze fluid with Haze 700. You can purchase this from a local or online retailer. Important: Using non-water-based fluids with this product will void its warranty. How do you clean the Haze 700 properly? First, always first unplug your Haze 700 from the wall outlet. After each time you use Haze 700, turn the Output knob on the remote control completely counterclockwise, and then wait for 1–2 minutes. This will allow the heater to clear itself of any remaining fluid. Additionally, we recommend wiping its metal housing with a soft, clean cloth. You may also use compressed air and soft brush or a vacuum to remove dust from the external vents or internal parts. Important: Do not clean Haze 700 using solvents or harsh detergents. The remote that is included with the Haze 700 has a Power Switch on it to power the unit on or off. This light will illuminate when Haze 700 is powered on and after powering it on, wait for 2–3 minutes until the heater is warmed up and the Ready light on the remote control illuminates. It also has a very important Output option. Turn this knob to control the amount of haze (0–100%). If you have any questions about this product by MARQ, contact us by completing and submitting the form below. If you are looking for a specif part number, please include it with your message.